On Saturday, 4/9/16 (Day 97) after leaving my cousin's house in Notthern Georgia, I headed out looking for the start of the southern end of the Appalachian Trail. Websites were confusing to me on how cot get to where the A.T. starts. 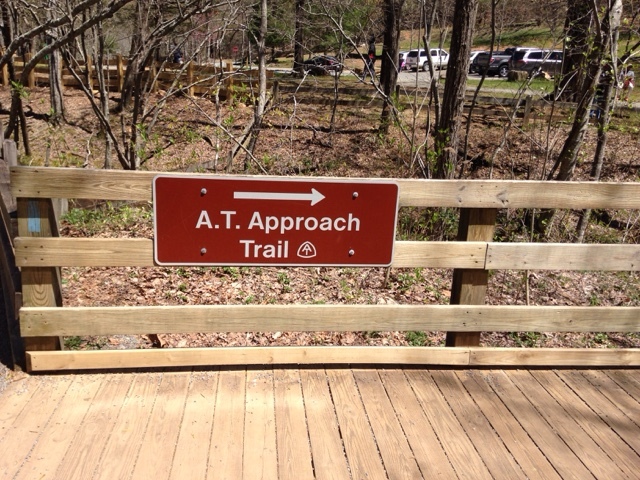 My decision was to go to Amicalola State Park as it has a trail listed as the A.T Approach Trail. I arrived at the toll booth for the state park and I asked if this was where the start of the Appalachian Trail was and I got a kind of sort of yes story. 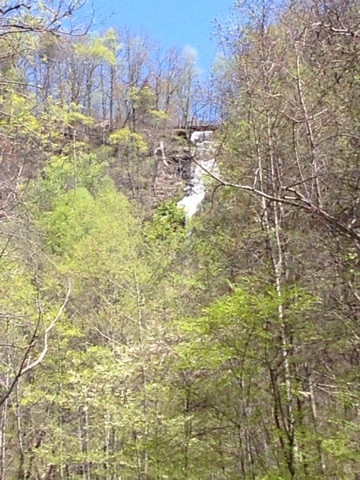 The story included the words Springier Mountain. Since it was well approaching mid-day I figured I would pay to enter the park and see the falls and ask the visitor center for more A.T. Information. I had a hard time finding s parking spot close to the visitor center for information on such a nice spring weekend day. I parked up hill and walked down to get the information. Once inside a young woman asked me if I needed help and I said I am looking for the start of the Appalachian Trail and she began the explanation. 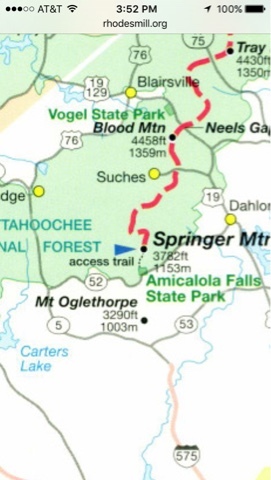 She said the State Park where we are is the Approach Trail for the Appalachian Trail and that the actual trail starts 9 miles to the east on Springer Mountain. I asked if this is where the A.T. market is and she said yes. 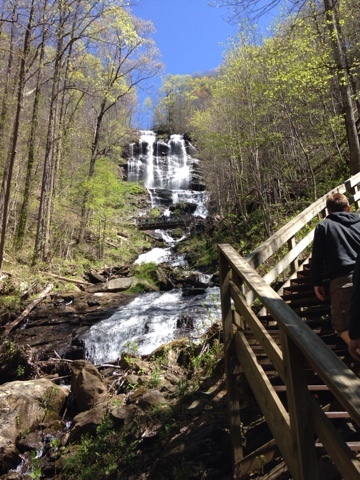 She went on to explain that about half begin their trek on the A.T. from the campground here at the state park the rest start at Springer Mountain either walking up the 6.5 mile Forest Service Road to the top of the mountain or get a ride to the top on a so so dirt road. She gave me the written directions to the A.T. Trailhead and that my Prius should make it up the steep dirt Forest Service Road. 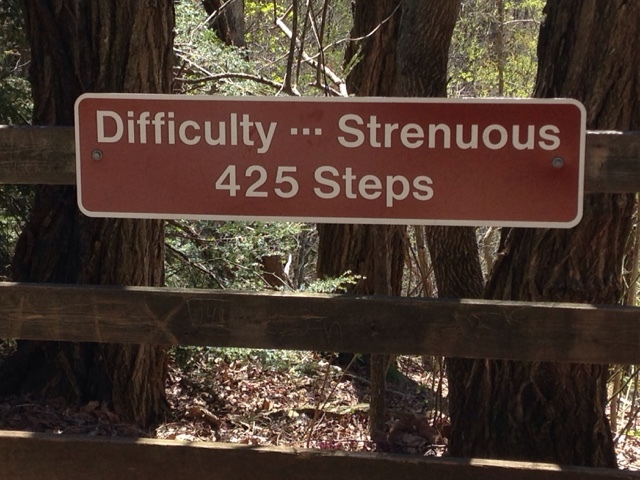 The 9 miles to hike to the trailhead from here is compared to the 1.25 hours to drive to the top of Springer Mountain and then .9 miles hike to the actual start of the Appalachian Trail. 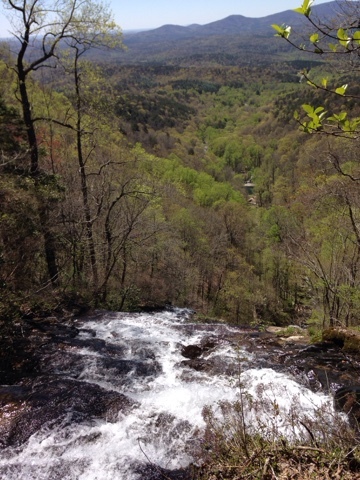 Since I was headed back to AL and the GTG I did not have the time to add this drive and hike to my day. Also I did not know if my Prius could make it up the mountain road. So I decided to hike the A.T. Approach Trail up this mountain and see the falls. It's a strenuous hike up the stairs there are over 200 to start. 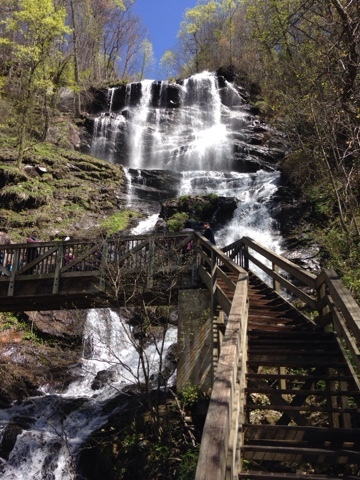 Then you add on 425 stairs to the top of the falls. It's a short hike that required me to take a couple breaks on the way up. At the top it is very scenic. At the top of the falls the A.T. Approach Trail continues to Springer Mountain. I did not have enough time to make the now 8 mile hike to Springer Mountain, so my quest to see the A.T. marker will have to wait for another opportunity. Above you can see the detail showing the Approach trail from the state park to Springer Mountain. 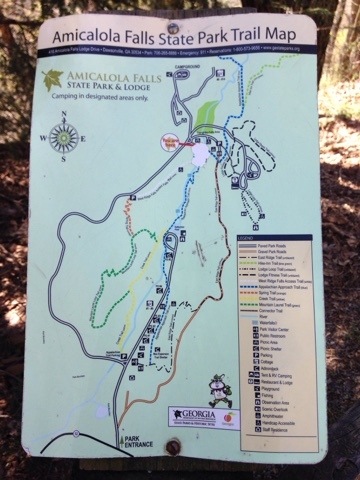 The reason I came to find the A.T. Trailhead was because I took the REI course last fall in hiking the trail and wanted to see where it started. My Prius - "Living in a really small Space." How To Live In Your Prius - Yes You Can!